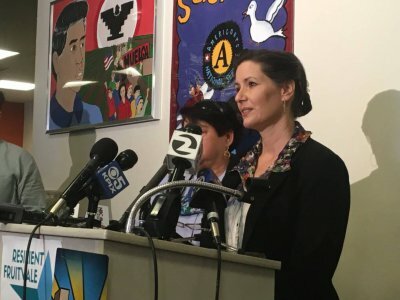 A few days ago, Oakland, Calif., Mayor Libby Schaaf publicly announced an impending raid by agents of Immigration and Customs Enforcement (ICE) targeting known criminal aliens and prior deportees who returned illegally. Schaaf went so far as to advise aliens that, if approached at their homes, they should refuse to open the door to agents since they had no legal obligation to do so. This isn't the first time Schaaf has announced pending ICE raids publicly, although she remains unrepentant. She goes so far as to claim that her actions are legal because she didn't get her advance warning of the enforcement action from "official sources". Needless to say, ICE officials have slammed Schaaf's actions as dangerous and counterproductive. ICE also claims that because of her antics, they didn't pick up nearly as many aliens as they had targeted or believed they would take into custody. All of this raises several points worth considering. First, ICE officials are right in their depiction of Schaaf's disgraceful conduct. Encouraging aliens to take steps to resist apprehension isn't a wise tactic — particularly when the advice is given to a target group of aliens who have already proven themselves to be lawbreakers. It puts both the agents and the general public at great risk, which certainly seems contrary to the notion of public safety, which at least presumably should be one of Schaaf's prime concerns. Second, while it's true that within a home, an alien may refuse entry to an officer armed with an arrest warrant, whether it is civil or criminal in nature, there are some important limitations. Consider that agents may sit outside the house and wait until the alien emerges. If agents see the subject and he or she flees back inside, then agents possessing a criminal warrant of arrest (for instance, one alleging reentry after removal, which is a federal felony ) can follow the alien in, based on the doctrine of "hot pursuit". What's more, whether armed with a civil or criminal arrest warrant, if officers have cause to believe that an alien is holed up inside a house in an effort to evade apprehension, they may seek a search warrant authorizing them to enter the premises to seize the alien. In such a case, even if the officers began solely with a civil warrant alleging administrative violations of the immigration laws, the alien's refusal to cooperate in his or her apprehension might, depending on circumstances, also be cause to file a criminal action under other provisions of immigration law, such as willful failure to depart, 8 U.S.C. Section 1253. Third, there is the question of how Schaaf got wind of the impending federal action. She says she didn't get the information through official channels — but we're left pondering exactly what that means. It sounds like wordsmithing of the worst sort to me. It's likely — perhaps even probable — that, in the interests of the safety of its own officers, the local ICE field office notified the Oakland Police Department that they would be working the streets in certain areas at a particular day and time, so as to avoid dangerous confrontations between two armed sets of officials. This is known in the trade as "deconfliction". How, then, could such a leak possibly arrive at the ear of the mayor, if it wasn't via someone who had been "officially" advised? Over cocktails? One surmises that the mayor did, in fact, receive the information from other officials in a chain that emanated from the police department, even if the information was passed in an informal setting or via "unofficial" cut-outs. As I said, wordsmithing. Subparagraph (B) then goes on to enumerate criminal penalties ranging from five years to life, per violation, which means one offense for every alien who has been harbored or shielded from detection. The media reports that ICE has asked the Department of Justice (DOJ) to consider whether Schaaf's actions were felonious. Notwithstanding Schaaf's assessment of the legal standard, the statute says very clearly "any person", which obviously includes Schaaf, and makes absolutely no reference or distinction as to how the person went about the unlawful harboring and shielding. The question of whether or not Schaaf's actions went over the line from lawful to felonious, therefore, doesn't depend in any way whatever on having obtained her inside information "informally". That is not the threshold question. But Section 1324 isn't, in my view, the only federal statute that may have been violated. Another provision in the federal criminal code, which also may apply to the mayor's actions, can be found at 18 U.S.C. Section 1505. "Obstruction of proceedings before departments, agencies, and committees", at paragraph two. Finally, there is the possibility of charging the mayor under the excellent and extremely broad catch-all, "Conspiracy against the United States", codified at 18 U.S.C. Section 371. It has been used successfully in matters ranging from the Volkswagen emissions scandal to, most recently, Rick Gates, a former Trump campaign official, who pleaded guilty to that charge in exchange for dropping of several other felony offenses. Since on its face, this provision of law requires that two or more persons join together in the conspiracy, who, you may ask, participated in a conspiracy, if one existed? Why, self evidently, the "person or persons [presumably] unknown to the government" who provided the inside information on the upcoming raid so that Schaaf could thereafter spill the beans. I won't speculate on how DOJ will respond to ICE's request, but I suspect that the decision to charge Mayor Schaaf (or not, as the case may be) will range far beyond the legal questions and into the realm of politics. It's always this way where immigration enforcement is concerned, and that's one of the reasons the nation's immigration laws are, as often as not, honored in the breach.